The Eagles might have a 2-1 record, but anybody who has seen them play this year would struggle to reconcile their winning record with any sort of winning play on offense. Philadelphia’s produced the league’s second-best defense per DVOA, but their offense ranks 31st by the same metric. The root cause is easy to figure out: Through three games, Philly’s offense has produced 12 turnovers. Since 1990, only five teams have turned over the ball more frequently than the Eagles have during their first three games. Unfortunately, the root cause of all those turnovers is also pretty clear. 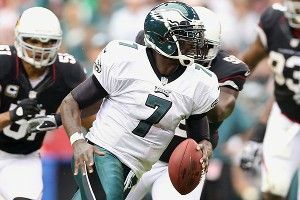 Michael Vick remains the league’s most terrifying quarterback, but his unpredictable, unteachable athleticism has gone from scaring opposing fans to bewildering his own. It’s telling that Andy Reid — who knows exactly what he’s saying when he talks to the media — suggested this past Monday that the team was with Vick “right now” but would “evaluate it as we go.” Granted, Reid spent the better part of a half-decade slowly benching Donovan McNabb through similar methods, but this is the first time that there’s been any questions about Vick’s status as the starter in Philadelphia. The question we pose today, then: Is the guy who has stunk up the joint these past three weeks the “real” Michael Vick? Let’s start with the numbers and see just how far Vick has fallen. During his career, Vick’s seven seasons as his team’s primary starting quarterback have produced an average of just under 13 starts per year. It is a remarkable coincidence for the purposes of this column that Vick has just finished his 26th regular-season start as an Eagles player (excluding a game against the Redskins in which he left with an injury after one quarter). That’s basically two full seasons of Michael Vick, Eagles starter. How has his performance shifted during those two seasons? Well, that’s an unpleasant swing. You could live with the declines in completion percentage and yards per attempt, but Vick’s touchdown-to-interception ratio absolutely collapses, falling from 3-to-1 to under 1-to-1. It’s tempting to say that he turned into the old Michael Vick, but even the Falcons-era Vick threw 71 touchdowns against 52 picks. Falcons Vick threw interceptions on 3.0 percent of his passes; Eagles Vick threw picks on 1.8 percent of his passes during his first 13 starts with the team before seeing his rate more than double to 3.9 percent. If you’re an Eagles fan, that’s the scariest part of this whole downward swing. I’ve written a bunch in the past about interception rates and how random they can be from year to year, but if you look at Vick’s career interception rates, the outlier isn’t what Vick’s done over those last 13 starts; it’s what he did during his early days as the Eagles starter. Vick’s disappointing performance over these past 13 games could be much closer to the “real” Michael Vick than the guy who ran rampant over the league in 2010. Is there a consistent, correctable trend that shows up across those interceptions? Perhaps. I went back and watched each of Vick’s 18 interceptions over his last 13 starts from both the TV angles and, where available, on coaches’ film. As it turns out, there are two very distinct types of interceptions that account for virtually all of Vick’s turnovers. One is on the tipped pass. Three of these plays are passes that were either tipped or intercepted at the line of scrimmage, which has been a problem for Vick because of his propensity to throw from almost a sidearm angle. Football Outsiders counted 19 passes that were tipped at the line or knocked down there for Vick last season, which was tied for the league lead with Matt Hasselbeck. In addition, there are those Vick passes that are tipped by a receiver and then caught by a member of the opposing team. That’s happened to Vick five times over the past 13 starts, including twice against the Browns in Week 1. Often, these picks look a lot like Vick’s second interception from that game. Vick forces a throw into some meaningful amount of traffic, and while it’s a high-velocity throw, it doesn’t have the accuracy to be gathered in. Instead, the Philly receiver throws up a desperate hand to try and make a ridiculous catch, the ball takes a deflection, and it ends up in the hands of a nearby defender. Combine those two groups into one “tipped” category, and that’s eight of Vick’s 18 picks. The other primary drivers of Vick interceptions are players who Vick seemingly fails to pick up on before he makes his throw, guys who ghost into the passing lane after the pass is out and intercept it before the ball gets to his receiver. These undercutting defenders have been responsible for six of Vick’s ten remaining interceptions. Examples would include Nick Barnett’s pick-six of Vick last season (a play also affected by an impending hit), and Bernard Pollard’s interception of Vick in the end zone in Week 2. In each case, Vick tries to make a throw to a receiver moving horizontally on a crossing route or a slant, only to fail to properly account for the moving members of the defense. Vick passes in these situations basically turn into failed frogs from Frogger. Of the other four, one was a Hail Mary play that was intercepted, and another basically amounted to one. The good news is that the tipped interceptions shouldn’t happen quite as frequently as they have been. Some of those passes have to hit the ground once in a while. On the other hand, the bad news is that it’s hard to imagine Vick’s propensity for being blind to those lurking underneath defenders in zone improving very much. Vick makes plays by making snap decisions on the run and trusting his athleticism to make both throws and runs that other quarterbacks wouldn’t be able to sniff. The cost of doing business with Vick might be a few of those picks per season. Vick could also use a bit of help from his teammates. After fumbling just five times on 801 touches during his first three seasons in the league, Shady McCoy has two fumbles in three games. A return to form would help make Vick’s life a lot easier. Unfortunately for the Eagles, these ugly starts in terms of turnovers tend to continue through the regular season. As I mentioned earlier, just five teams since 1990 have produced a higher turnover total over their first three games than the Eagles. In each case, while those teams saw their turnover rates dip below their crazy opening three-game average, they didn’t bounce all the way back to league average. They offered up 130 giveaways in 65 games, an average of exactly two per game. Philly’s offense needs to turn the ball over less frequently than that to stay healthy and productive, a move that Vick might find difficult to master. His interception rate might dip down to that 3.0 percent rate from his Falcons days, but chances are that we’re looking at the “real” Michael Vick for his first extended stretch since he joined the Eagles. The Michael Vick from 2010 might not have enjoyed such real change after all.